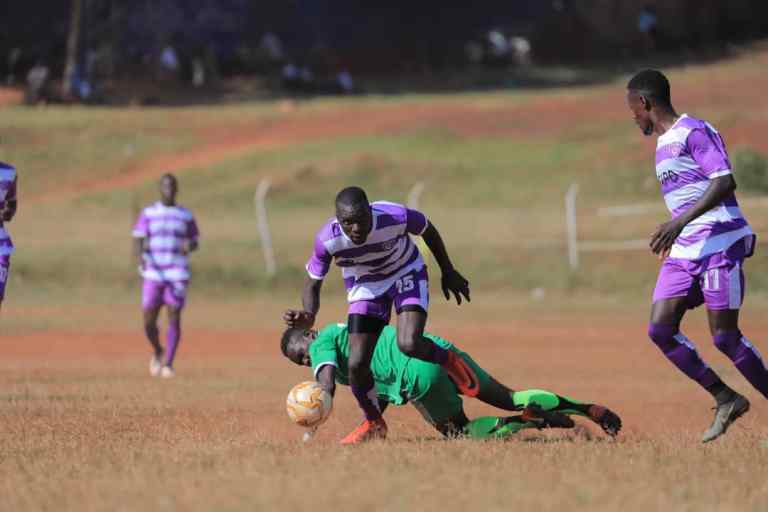 Wakiso Giants maintained their unbeaten run in the 2019/19 FUFA Big League thanks to a comprehensive 3-0 victory over Amuka Bright Star at Bugembe. Debutants Yasin Mugume and Norman Ojik were on the scoreline for the Money Bags, either side of Captain feni Ali’s goal. Amuka who held Wakiso to a draw in the first round game, saw Fred Watongo sent off for two yellow cards on Thursday. This was Wakiso’s 6th win of the season and they now have 23 points from their first 11 games and on the road to gaining promotion to the top tier. Ibrahim Kirya’s side are 4 points ahead of second placed Dove Alla Stars who face Kataka in Mbale on Sunday afternoon. Elsewhere in the Elgon Group, the games involving the other eight teams ended in draws. JMC Hippos drew 0-0 with Bukedia, Entebbe and UPDF shared spoils in a 1-1 affair, Light and Kataka also drew 1-1 while Water and Kiboga Young played out to a thrilling 2-2 encounter. Meanwhile, in the Rwenzori group, Kitara inflicted a second loss of the season on Proline, defeating the Rwenzori Group leaders 1-2 at Lugogo. The only goal of the games came on 8 minutes, off former SC Villa striker George Ssenkaba’s foot. Despite the loss, Proline remain top of the standings in the Group with 23 points, one ahead of the duo of Kiboga Young and Dove FC. In the other Rwenzori Group Games, Kansai Plascon defeated Kira United 2-0 to keep pace of the leading pack. For Masindi based Dove and Kabale Sharp, they played to a two all draw at the Katushabe play ground while Water and Kiboga also enjoyed a similar result in their game. The FUFA Big league returns on Sunday with two matches. Kataka hosts Doves All Stars Stars at the San Siro play ground in Mbale while Kyetume entertains Amuka Bright Stars at the Nakisunga play ground in Mukono.